The boy knows that he’s not perfect without being told. All the people in his world have imperfections. 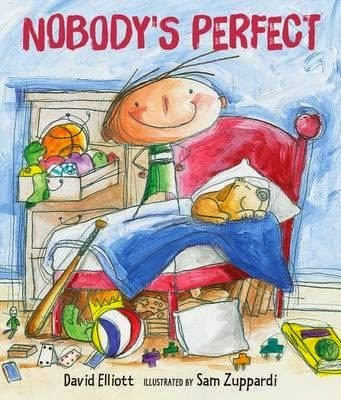 His friend Jack, the dog that sleeps on his bed and his loud little sister all have imperfections. So has his mum who has made him sit on the naughty step. But the perfectness of their imperfection is what makes life interesting, exciting, challenging and fun. That ‘messy, loud, stubborn and show-off’ is imperfection, well – nobody is perfect! This delightful book is a celebration of life and its imperfections. Filled with colour, movement and a strong message about being individual and free especially during childhood, this is ideal for the 3+ age group. It can be shared between adult and child or any other combination of readers. It has an eye-catching cover which reflects the contents of the book perfectly. The illustrations are childlike, expressive, and joyous, with watercolour and pencil art that children can immediately relate to. The double-page spreads are priceless, for they portray most children’s rooms, before and after a clean-up.